I'm new to this forum but have been using Garmin Outdoor GPS on my off-road bikes for over 15 years and make my own transparent overlay trail maps from tracklogs. I recently switched from bikes to a Miata Car Club and their tours usually have a GPX route (made in Tyre or Basecamp), but many members have problems using the routes (for all the usual reasons!). I have an old Nuvi 765T that I used in my truck/travel trailer that worked fine with Routes from Mapsource, but I decided to get a newer Nuvi (a recon SmartDrive 50LMTHD for $99 at GPScity.ca) as I wanted LM feature. I thought I could solve the Club route problem by converting a "good" route to a track and then making a simple overlay map. Instead of the long process I use for my detailed maps (MapEdit, cGpsmapper, Typwiz, MapSetToolKit) I tried IMGfromGPX2.5. It seemed to work good on the first trial drive 3 days ago, but reviewing my numerous screen shots taken during the tour it appears to display incorrect routes at times. I've read back through the last 2-3 years of posts and found only a couple of mentions of using transparent overlay maps (from Boyd? ), that suggested there might be a problem with the newer (post-2013) GPS, Has anyone any current experience with these custom maps made from IMGfromGPX or GPX2IMG? I don't mind using my "long" method which I know works well, but we'd need the simple one-step method if we want to get each tour organizer to produce their route in an overlay format IMG file. It seemed to work good on the first trial drive 3 days ago, but reviewing my numerous screen shots taken during the tour it appears to display incorrect routes at times. I don't understand this part. Maps and routes are completely different things. 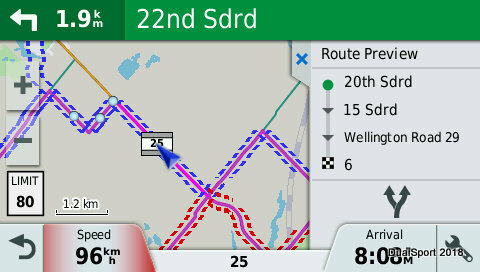 A map either shows or it doesn't, it cannot display an "incorrect route". From what you describe, there isn't a problem with the transparent map itself so something else is wrong. 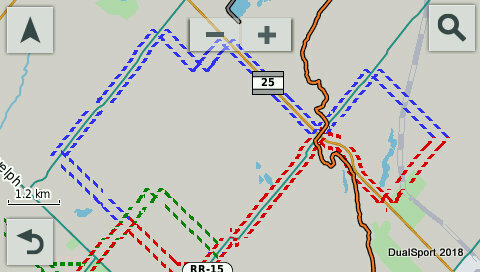 I would compare the source .gpx file carefully with the transparent map, that may reveal what's wrong. The idea of each person making their own transparent overlay sounds very problematic, unless they are technically inclined. Of course, the real problem is that Garmin automotive units cannot import tracklogs. On a Garmin handheld it would be very simple to just use a tracklog to show the route. And this is just more typical Garmin marketing... they want you to buy a handheld (or a Zumo). The Route was poorly designed as it had crossovers, repeat use of same road section, repeat use but in reverse direction. I decided that my overlay map would need the "track" broken into 3 different coloured sections so you could understand the turns. During the drive I noticed at one point that there was an "extra section of track/map" at the top of the map. The shape of this add on was NOT the same as any other part of the map, but unfortunately the only one of my dozens of screen shots only shows a tiny bit of it. BUT it proves it happened. The extra Blue section actually stayed on the map until I Disabled it and then Enabled it. It didn't repeat from the balance of the tour. During this Club Tour I was trying to make my Modified Route (with "Do not alert" shaping points) as the usual Club Route uses Via Points and all you see is a mass of Orange flags and continually get announments of arriving at meaningless points. I drove off-route, stopped/restarted routing, took shortcuts, etc to make something fail. However, I agree with your comments - it should be impossible for an overlay map to display "an extra piece" but it did. I thought it may have been due to using the quick and dirty IMGfromGPX (which produced inconsistent zooms level visibilites for different coloured sections !? ). I will try the whole exercise again by making a new overlay map with my traditional programs and retest it. I'd hoped the one-step "GPX to gmapsupp.img" was the only way we could get individual tour planners to provide an overlay map. I may have to scale back my expectations. Thanks for you input - especially the link to GPSfiledepot - hadn't seen that before.